3,600 years ago, Santorini was a circular island, cone-shaped as usual volcanoes. It was then called Strongili – "the circular one". The island had been created during millions of years of active volcanism. Again and again, eruptions took place and the lava-stone caldera, ash and pumice kept own growing on the rock base. Still today there are some regions which have no volcanic origin, especially next to Profitis Ilias. This region is therefore much older than the volcanic rest of the island. About 1,600 years b.C., there was a devastating eruption. Masses of rock had closed a chimney, inside which ascending gases created an immense pression. Finally the chimney exploded, and this eruption let a vast quantity of magma, rocks and ash rocket upwards. Even in distant regions rains of ashes fell down. Particles were torn up to the stratosphere and reduced solar irridation so strongly that temperatures dropped all over the world. Santorini was buried under a bed of ashes and pumice, which was almost 60 m thick. Liquid magma gushed into the sea, making the following eruptions even stronger. The island became an inferno. 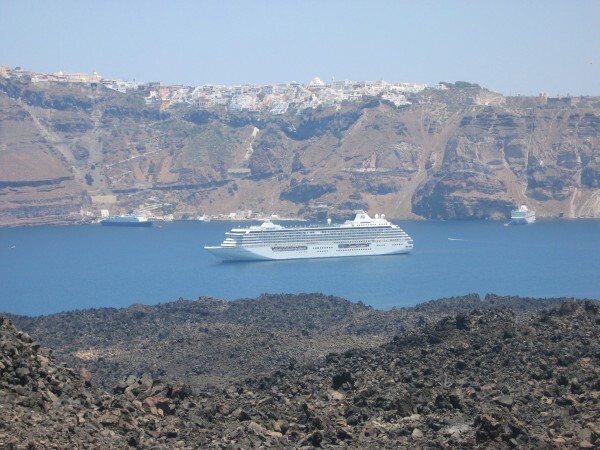 Today it is often said that Santorini has its form due to the great explosion that busted a part of the caldera. This is not really exact. It was only after the eruptions that the submontane chamber of magma – underneath the archipelago - had emptied itself and collapsed. This crash created the caldera’s today shape. Scientists are not sure how long this collapse took; but nowadays they believe that it was not one fast crash but a slow, gradual concurrence. The result for the island’s shape itself is the same but, if there had been one fast crash, a flood wave would have emerged and severly damaged the Mediterranean coasts. This idea was believed to be verisimilar during a long time and used to explain the destruction of the Minoan palaces of Crete. But today this theory has been largely discarded. Santorini disintegrated slowly, and somebody else has to answer for the palaces. It is remarkable that Santorini’s natural disaster did not claim any or at least hardly victims – after all, Strongili was already populated for 1,400 years when the explosion ocurred. So, people obviously had been warned, probably by foreshocks, and had managed to leave the island just in time. In Akrotiri, a whole settlement was conserved terrifically under a thick bed of ash, and many details were found, allowing conclusions about then ways to live. But, among all those things, no mortal remains were discovered, not even of animals. The volcano has marked Santorini’s destiny in many ways. Not only that it once shaped the island violently – and continues to do so -, it also created new bases. Without its spectacular history, Santorini would never have become such a popular destination.